Those (Jews) who incurred the curse of Allah and his Wrath, and those of whom (some) He transformed into apes and swine. This is a translation which was sponsored by the Saudi government and made freely available by them. It is also interspersed with paranthetical notes expanding on the original text. Thus of the 8 parallel English versions of this ayah found in the Leeds Qurany Tool site, only the Hilali-Khan translation quoted above includes the word “Jews” – an addition that derives from the interpreters’ desire to clarify the meaning as they see it, a desire found also in the same translation at 8.60, where “And make ready against them all you can of power, including steeds of war” is followed “(tanks, planes, missiles, artillery)” – tanks, planes, missiles and so forth being a little too modern for the original Arabic to have specified them. The word “Jews” is also lacking in the original Arabic — but the context makes it clear that “People of the Book” (both Jews and Christians included) are being addressed, and that it is when they turn away from the One God and, as the Old Testament prophets would say, “go whoring after false gods” that the wrath and curse falls upon them. What it means – whether it should be applied to a sub-group of Christians and Jews at the time of the Prophet or to the entire Jewish race today, and whether it is to be read in a literal or metaphorical sense – it is certainly widely taken in a literal sense as applying specifically and literally, today, to the Jews, in Israel. Jerusalem is exposed to every vagabond, and its parts belong to every nomadic traveler – and this since the settlers, the rabble descendants of apes and pigs began defiling the parts of Jerusalem … Allah, we have entrusted you with the throats of the Jews; Allah, count them and kill them one by one, do not leave even one of them upon the land of Palestine. The Quranic quote with which I opened this move, the Al-Aqsa (Hamas) TV quote above, and many other similar jibes and curses against the Israelis / Jews can be found in this PalWatch study of the Demonization of Jews/Israelis. Contrary to many of the commentators who take this reference to “apes and swine” in a literal sense, the famous tabi’i Mujahid explains it as a metaphorical description (mathal) of the moral degradation which such sinners undergo: they become wildly unpredictable like apes, and as abandoned to the pursuit of lusts as swine (Manor VI, 448). This interpretation has also been quoted by Tabari in his commentary on 2:65. 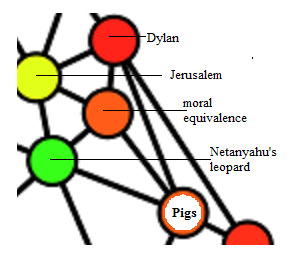 For lighter reading, this time on the possible moral equivalence between pigs and other treif creatures — for example, eagles — see: Is Pig More Unkosher Than Other Animals? — a view from Chabad. The Said Symphony is a fugal work, and it is only natural that its themes will recur. This business of throwing animal names around has been with us for quite a while, and Jerusalem herself has been assailed in this way, by Muslim and Jew, across at least a millennium. And sometimes, just sometimes, the hatred backfires. We were furious, failing to understand how anyone could deliberately harm such a cute little creature who did nothing but bring much needed gaiety into our lives. Imagine our shock when we learned that the ex-warrior gleefully told everyone who would listen that the baby monkey was not a monkey at all, but was a Jewish person turned into a monkey by the hand of God. In his eyes, he had killed a Jew!My entire body shook when I heard such ridiculous talk. I was young and admittedly unsophisticated, but I was a rational thinker who knew that monkeys were not Jews and that Jews were not monkeys. One had nothing to do with the other. Like many Arab children, I was aware of the enormous dislike, and even hatred in some cases, between Muslims and Jews and between Muslims and Christians. Children are not born with prejudice, however, so although I knew that many Muslims considered Jews their bitter enemies, my thoughts did not go in that direction. I was even more astonished when I was later told that it was my father who had convinced the veteran of the ridiculous Jew/monkey theory. Source: Omar and Najwa bin Laden with Jean Sasson, Growing Up bin Laden. In general, revelation is the unknown becoming known, the hidden secret speaking / showing itself. Judah ha-Levi, accordingly, is in full accord with the spirit of Judaism when he declares the revelation on Sinai to be the great historical fact upon which the Jewish faith, as far as it is a truth revealed, rests (“Cuzari,” i. 25, 87, 97; iv. 11); and this is also the rabbinical view. “The Lord appeared to the people of Israel on Sinai face to face in order to pledge them for all generations to come to remain true to Him and worship no other God.” The Lord spoke with every single Israelite on Sinai, so that each heard Him say, “I am the Lord thy God”; as it is said, “the Lord spoke with you face to face in the mount out of the midst of the fire” (Deut. v. 4). He appeared to them in differing aspects (“panim” = “countenance”)—now with a stern and now with a mild face, corresponding to the varying relations and attitudes of men and times (Pesi?. R. 20-21; Mek., Beshalla?, Shirah, 3). I was a hidden treasure and I loved to be known; so I created the creatures and made Myself known to them; so they knew Me. It was revelation that gave him this insight, and revelation is the mode of knowing by which we gain theophanic knowledge of the divine. More specifically, Revelation is the final book of the Christian Bible, Omega to the Alpha of Genesis, setting forth the revelation of things unseen which was given to John on the Greek isle of Patmos… and it is with that book chiefly in mind that I play this move. See also Son House‘s John the Revelator. 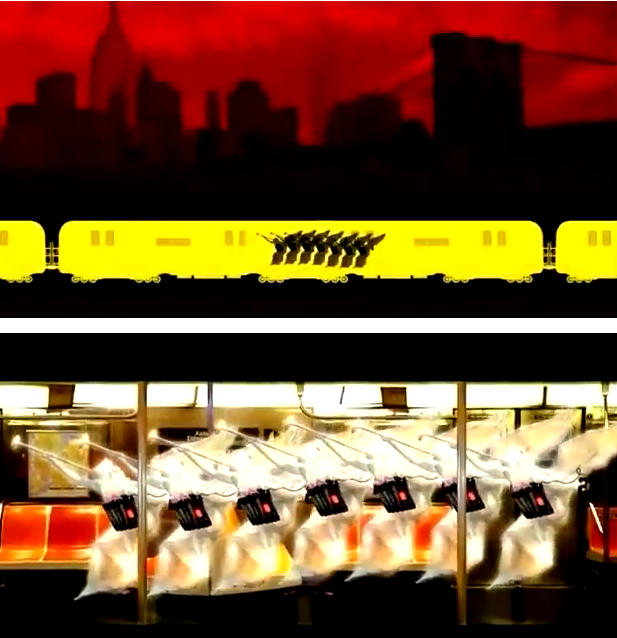 Depeche Mode‘s very different variant of the same song attacks apocalyptic fear and trembling, and can be seen on YouTube in what is described as an unofficial video, accompanied by some astonishing examples of contemporary apocalyptic imagery, see above. In Greek, the Book of Revelation is known as the Apocalypse – “apocalypse” simply meaning “the revealing of what was hidden”. 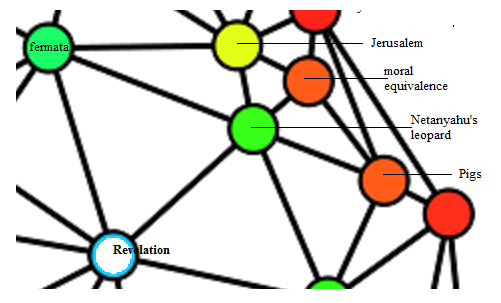 Our modern use of the term “apocalyptic” to refer to terrible times of destruction, fictional or prophesied, stems from the fact that the vision of John of Patmos as described in the book of that name foresees times of terrible destruction (it’s hard to beat “every island fled away and the mountains were not found” for global catastrophe) before God’s kingdom is established and the “holy city, new Jerusalem” descends from heaven “prepared as a bride adorned for her husband” (2.12). I am grateful to my friend Stephen O’Leary, author of Arguing the Apocalypse, Oxford, 1994, for pointing me to the leopard in Revelation 13.2 and thus suggesting this move to me. This entry was posted on Sunday, March 4th, 2012 at 3:37 am	and is filed under Charles Cameron, Said Symphony. You can follow any responses to this entry through the RSS 2.0 feed. Both comments and pings are currently closed. What sprang immediately to my mind was Durer’s woodcut, Saint John Devouring the Book from The Apocalypse, c. 1497—98. 4And when the seven thunders had uttered their voices, I was about to write: and I heard a voice from heaven saying unto me, Seal up those things which the seven thunders uttered, and write them not. … And I went unto the angel, and said unto him, Give me the little book. And he said unto me, Take it, and eat it up; and it shall make thy belly bitter, but it shall be in thy mouth sweet as honey. ….